Back in July 2015 three inches of snow fell on Mount Panorama, Bathurst – the home of Australia’s most-famous racetrack. Snowfall like this reportedly wasn’t uncommon prior to the 1950s but these days it’s a very unusual occurrence. The dump in 2015 was the most seen there since the mid-1980s, when the mountain copped a serving of snow in the lead-up to the 1984 Bathurst 1000. A rare event, in other words. An edge case. Definitely not the kind of thing I’d ever have expected to be replicated in a racing simulator. And yet, here I am in Project CARS 2, on a clear, winter morning – the sun low and beaming bright – gingerly nursing a brand-new F-Type Jag around a frigid and frosty Mount Panorama, blanketed in snow. It’s not easy, and I don’t think I’d ever want to actually race in it, but it’s definitely unique. The F-Type is a capable sports car but there’s not exactly an overabundance of grip available here; I have to be considerably more cautious. There is a silver lining, though; every time I get off the throttle I’m rewarded with the rich crackle of the F-Type’s exhaust, which pops and splats like a rapid stream of squash balls being fired into thick glass (Project CARS 2’s F-Type Jag may be the best-sounding car I’ve ever heard in a video game). Bathurst has appeared in plenty of racing games over the years, and it’s my favourite racetrack, but I’ve never driven on it in this state. Slightly Mad Studios took something most other racing developers have these days and gave me the tools to make it something different. This is Project CARS 2 in a nutshell, really. Any track, any season, any car. Snow on Bathurst? Sure, why not? IndyCar open-wheelers on an unsealed rallycross track? Go ahead; good luck. After considerable poking and prodding, about the only restrictions I found were that you can’t use anything but karts on the kart tracks, and you can only race on the Mercedes Benz ice track facility in winter (the ice tracks are on a frozen lake, so you’d need a boat in summer). Any track, any season, any car. I’ve been tooling around with an unlocked preview build of Project CARS 2 for a while now but I feel like I’ve barely scratched the surface of what’s available to do in it. The bullet points are one thing – 180+ cars, nine motorsport disciplines, 60 venues, 130+ layouts – but combined with the way the conditions at each and every track can vary wildly they’re something else entirely. Nothing about Project CARS 2 feels static; it feels like a living world. Tracks take on brand new dimensions depending not just on what time of day it is, but what time of year it is. The original Project CARS features a decent garage of cars and loads of tracks (and it also boasts a range of dynamic time-of-day and weather effects) but Project CARS 2 is already a huge step up in all of these areas. Combined with the significant handling overhaul, the amount of racing, testing, and experimentation all of Project CARS 2’s new and returning vehicles and tracks can offer seems enormous. The impact of that handling overhaul, by the way, cannot be understated. I didn’t mind the handling in the original Project CARS (it’s grippy and stable) but it was very punishing on over-the-limit driving and required a lot of tinkering to hone it to a gamepad. Over the past year, every time I’ve covered Project CARS 2, readers have commented with their issues regarding the original game’s handling. My advice, at this stage, is to forget about that. On a wheel, Project CARS 2’s handling feels noticeably improved. The grip feels more natural and the force feedback language is doing a better job at communicating what’s happening to your car – especially when you’re teetering on the edge of losing it. On a gamepad – and this is the big one, considering it’s how the vast majority of players will experience it – it feels like a different game entirely. Throttle and braking control is still a bit tough on tiny triggers (without assists), but the steering is vastly more intuitive and less twitchy. This is out-of-the-box, too; I haven’t changed any controller settings yet. I don’t know that I’ll need to. The improvements don’t stop there. I’ve also put the new in-game race engineer to the test, letting the game adjust set-ups on my behalf based on the feedback I give it. The race engineer doesn’t replace the game’s granular, manual tuning options but it does give us a way to see beneficial tweaks applied to our cars quickly. It’s especially handy if you’re not quite sure what adjustments are necessary to counteract whatever performance issue you may be struggling with. Just answer the multiple choice questions on-screen and your engineer will come back at you with tuning suggestions that may solve your problems on track. 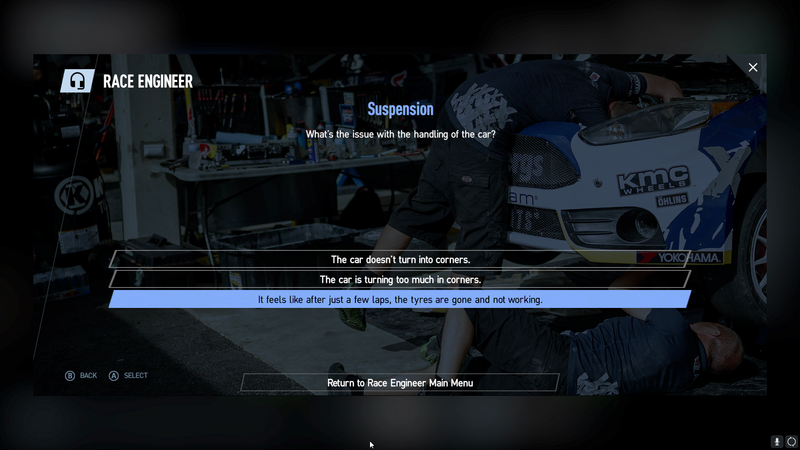 One of the strongest parts of Project CARS is its ability to make you feel like a real racing driver; in Project CARS 2 this is expanded by additions like this new race engineer functionality. It opens up a part of the game for players who want to throw themselves into the fantasy of being a racing driver but perhaps lack the engineering nous to squeeze the maximum from their cars. The period between now and November may just be the most competitive few months for racing games I’ve ever seen, but Project CARS 2 is looking, feeling, and sounding incredibly strong. Crammed with modern and retro single-player career racing, and with the promise of a strict, reputation-based licensing system and custom race leagues to improve its online racing, Slightly Mad Studios is well on the way to making Project CARS 2 2017’s serious racer to beat. Luke is Games Editor at IGN’s Sydney office. You can find him on Twitter @MrLukeReilly.